Athens Greece Weather - shows the current temperature and 5 day forecast below, just click on the bottom of the display 'get 7 day forecast' and it will show the forecast and hourly weather reports. Spring is from April to June, April is quiet in terms of other travellers and after Easter it is good for swimming. May is the time for flowers and long walks, visiting ancient ruins in an unhurried way, appreciating the history with less chaos and fewer visitors. Average temperatures starting at 16 °C or 61 °F in April and reaching a beautiful 26 °C or 79 °F in June. The summer months of July and August are very warm in Athens, with average temperatures of 29 °C or 84 °F. Night time is still warm with averages around 24 °C or 75 °F. Water temperatures are perfect for swimming, at the beaches of Vouliagmeni and Varkiza, and for visiting the nearby islands on day cruises, such as Hydra in the Saronic Islands, or Syros in the Cycladic Islands. Many locals leave the city for their own holidays during August and so, if you don't mind the hot weather, it can be quite relaxing. 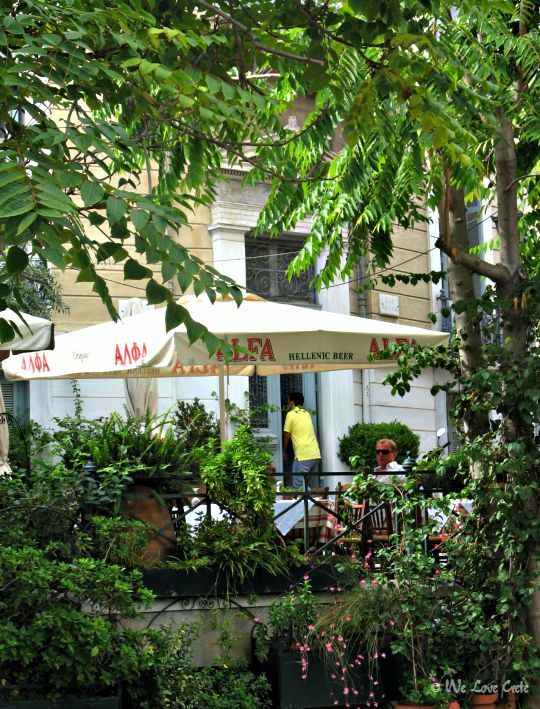 Take a siesta in the afternoon, then chill out at the rooftop bars late into the evening and enjoy the cafe culture in Plaka. This is a good time to visit the Acropolis Museum, without all the crowds. Feel the night air at the Grand Bretagne Rooftop Bar, Galaxy Bar or A for Athens, all with views to the Acropolis. 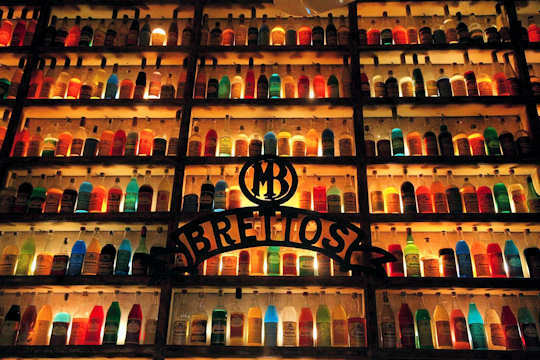 Or head to Brettos Bar - one of the oldest bars in Europe which began distilling its wares in 1909. Its colourful display has locals and travellers heading in to enjoy the atmosphere, and to try the homemade ouzo, brandy and liqueurs. 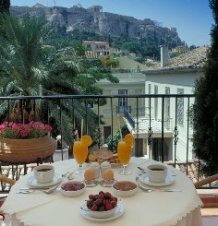 Located in the historical Plaka district, this is a local experience to get your taste buds ready for the ouzo in the Greek islands! 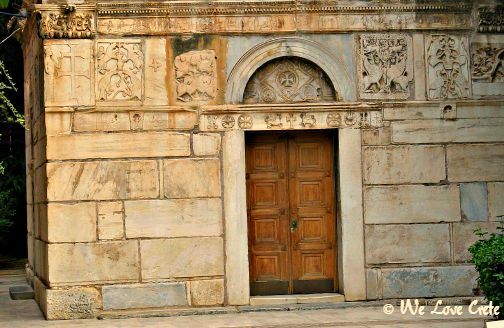 Athens Greece Weather - autumn is a good time to avoid crowds and enjoy the history of Greece. 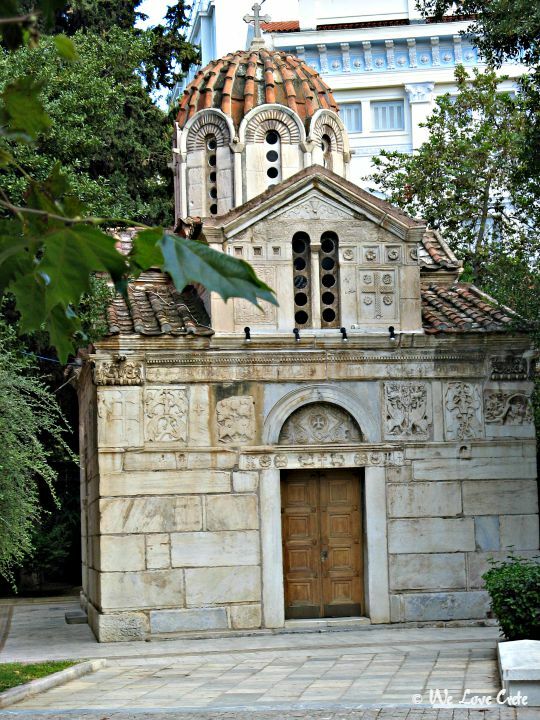 This 15th Century church is an example of the history on every corner of the capital - this is Agios Eleftheros on Plateia Mitropoleos, known as the 'Mikri Mitropoli'. Walking is great at this time of year, there are plenty of trails to explore here. Visit ancient sites, churches, monasteries, galleries and museums, not to mention cafes, bars and restaurants. Take yourself or take a small walking tour, explore the food of Athens or the grafitti art, or visit the major sights in the city to get your bearings before exploring by yourself. We suggest the Plaka and Picnic tour which allows for enjoyment of the historic green spaces in the ancient agora or marketplace. 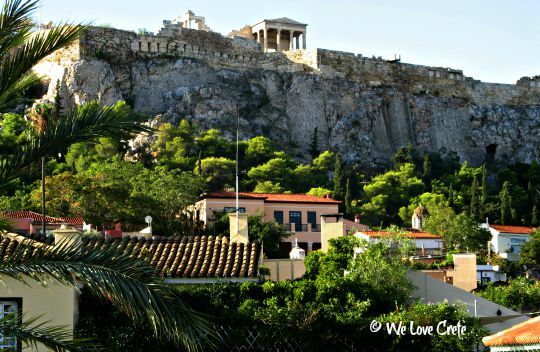 The autumn months of September and October are ideal months to visit Athens, with fewer visitors and cooler days. Average daily temperatures of 22 °C or 72 °F. 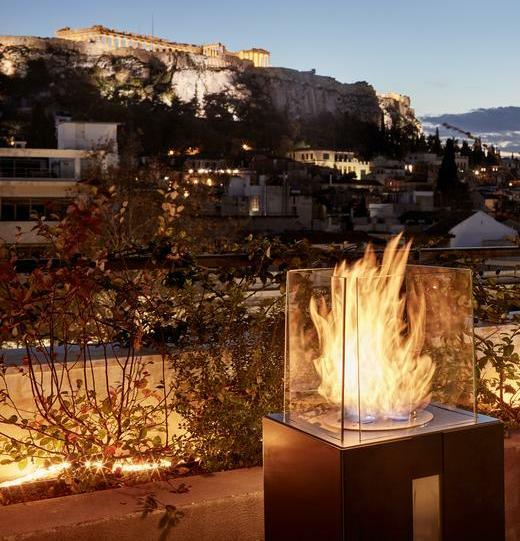 In autumn enjoy a rooftop fire with a drink and a view to the ancient Parthenon. Make the Grande Bretagne Hotel your base for a winter visit to the capital. Imagine the company of Maria Callas, Vangelis, Ustinov, David Niven and Olivier, whilst staying in this iconic Athens historic hotel. Perhaps you would invite Winston Churchill, Elizabeth Taylor and Bing Crosby to your imaginary table? Or Sting and Bruce Springsteen? You will be in good company in this sumptuous feast of a hotel. From November to March winter is here with cold temperatures, some blustery days, less sunshine and snow on the mountains. Bring your winter-warm layers and get set to meet the locals in restaurants, bars and nightclubs. Explore the mainland on wide open roads or enjoy cozy evenings with a little raki or cognac and plenty of good conversation. Winter daily temperatures average 11 °C or 52 °F with night times getting down to 7 °C or 47 °F. It rarely snows in the city, but it can. The Grande Bretagne is the most recognised, historic luxury hotel in Athens. Treat yourself to opulence in the winter months, enjoy views to the Acropolis and the convenience of the location on Syntagma Square. The ski fields near Athens are located at Mount Parnassus, the chic social scene in winter moves to the village of Arachova near the slopes. This large ski resort has many lovely small guesthouses from which to experience winter by the fire, and head out to the cafe-bars, restaurants and nightclubs enlivened by Athenians from the capital, enjoying the season. Make you own way to this hilly village which is 150 km north-west of Athens, near the ancient site of Delphi, or take a winter tour with all logistics catered for. 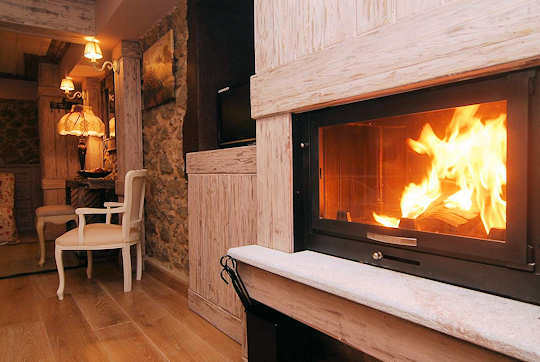 Alexandros Guesthouse in Arachova is a small, stylish place with plenty of rustic charm and winter elegance. Just 50 m from the main square, this boutique hotel is unique, with each room individually decorated, offering warm fires and saunas. This wooden beams, skylights and modern fixtures compliment the eclectic style, the overall effect is modern and cozy. Perfect for romantics, getting close together for an enjoyable winter break. 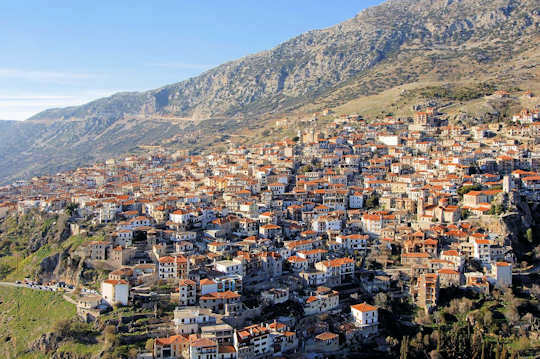 Enjoy romance and privacy yet be close to all the social action in Arachova.